The furore over BP CEO Tony Hayward's decision to watch a yacht race this weekend highlights the desire to pile the blame on somebody who should be in control when, in fact, the events are out of anybody's control. Don't get me wrong, if it turns out (as seems increasingly likely) that the blowout on Deepwater Horizon (or "Deep Horizon" as one of the inquisitors from Congress kept calling it) was due to BP's negligence then Hayward should be horsewhipped with a horsewhip. In the meantime he should be directing his company's sizable resources toward stopping the leak and cleaning the spill, but that doesn't mean he should be personally sucking oil out of the gulf with a straw, or forced to watch the live spill-o-cam 24 hours a day. Similarly, President Obama himself can't don a wetsuit and become a human 'junk shot' into the pipe, but the public acts as if his personal willpower is all that's required to plug the leak. Finally, I think the members of Congress grilling Hayward should STFU until they've divested themselves of all campaign oil dollars, and the general public should follow suit until they are willing to pay 9 bucks a gallon for gas. Before playing Algeria: "Against Algeria we can not be at our best and win the game." When asked what he knew about his opponents: "Not much. Belhadj from Portsmouth, but I don't really know much more about them. I'm sure the manager will point out their strengths and weaknesses to us." When booed off the field after a 0-0 draw: "Nice to see your home fans booing you. That’s loyal supporters." When asked what effect the Slovenia-USA draw would have on England: "I don't think it matters, to be honest, since England are clearly the best team in the group." When asked whether a problem exists in the English locker room: "In qualifying we beat Croatia [ranked 10th in the world] twice and Ukraine [23rd] once. They are both far better than the USA [14th] and Algeria[30th], so there must be something wrong." My office today before the kickoff of USA-Slovenia. Daniel managed to secure me a ticket to my first Cambridge may ball (all confusingly held in June), at St. John's college. It was a great time, with fireworks (above) and lots of other entertainments, bands, food and drink. I think Daniel has a photo of me in my tux, which I'll try to find and post. What a win by Mexico tonight. I went to watch Les Bleus chez Plagnol tonight, so it wasn't a jubilant atmosphere. The first goal was beautiful, especially because you have to understand the offside rule to fully appreciate it. The timing by Hernandez to break the offside trap was perfect, and he didn't panic when faced with a one-on-one against the French keeper, Lloris. Now I'm super nervous about the USA-Slovenia game tomorrow, working out all possible group standings depending on results. Bottom line is the USA needs a W.
A sweepstake at work where teams are randomly assigned to people. I got Switzerland and Greece, so there's a fiver down the tube. A fantasy league (still negotiating the amount). Hopefully some random side bets on various games being watched chez Carl on his giant TV. In all the correspondence on these topics I've been told to abbreviate it as the CdM (Coupe de Monde) because apparently WC doesn't show enough respect for the game. The Sanger Cricket Club plays in an intramural Cambridge league with other teams from University departments and similar entities. The level of skill is highly variable from former top-tier University and county players to complete amateurs. 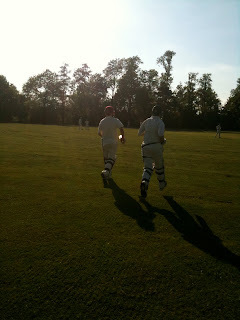 I quickly adopted cricket as my preferred local 'watching' sport when I moved to the UK, and last year I lurked on the cricket email list and watched one of the matches, but never actually held a bat or ball in anger. This year, however, I decided to enlist a bunch of friends as encouragement to actively participate, and have thus been attending practices for the last couple of months along with four other Human Genetics newbies (one of us is actually a ringer, but the others have either never played (me) or last played as kids). I'm still pretty terrible, but I've been really enjoying competing in a sport for the first time since youth soccer, approximately 20 years ago. All five of the HumGen boys were selected for our second match last week, so a bunch of other people in our department turned out to watch, since the home pitch is on the Sanger grounds (founding director and Nobel laureate Sir John Sulston insisted that the institute should have a pitch on site). In order to give the spectators a show, but to the detriment of our team's chances, Carl and I (pictured above) opened the batting. I was super nervous as I stood in to face the first bowler, but after a couple of prods which rolled straight to the fielder at short mid-wicket I managed to slap a shot forward of square leg to the boundary (which scores four runs). Because it's a limited over game and since Carl and I weren't exactly racking up runs after the first couple of overs, I started slashing at pretty much everything and edged it to the keeper during my second over. We managed to set a pretty decent total (149) after our 20 overs, so we took the field and put the game in the hands of our string of decent bowlers including two (Tejas and James) from the HumGen crowd. I spent most of our fielding innings in the doldrums of deep square leg and deep point, but did make a couple of decent plays at long stop. 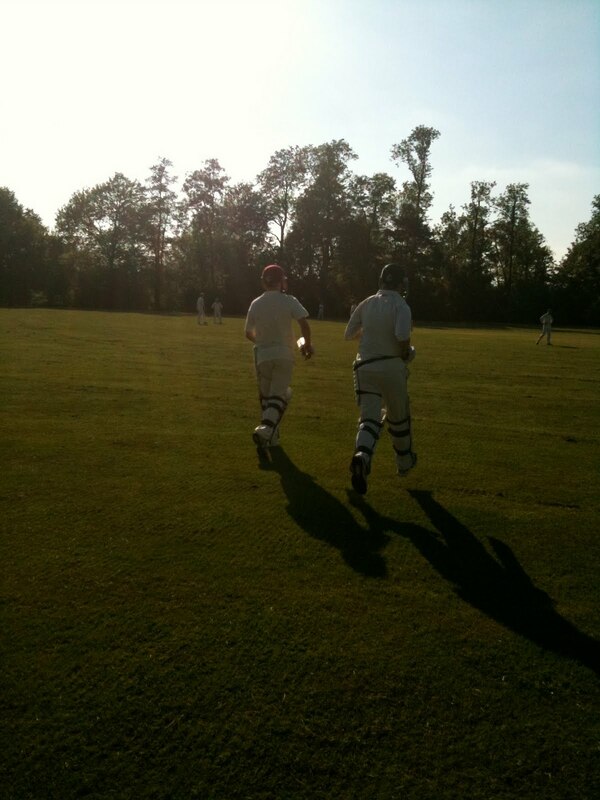 Carl made the catch of the game playing in cover, and our boys generally took wickets at a good pace. The opponents had only racked up about 100 runs with three overs to go, so our captain handed me the ball to bowl an over. My first two balls were nervously wide, but I settled in and managed to get through it while only yielding a few runs (bear in mind I was facing the very tail end of their batting order). Anyway, it was awesome, and last night should've been my second appearance, but was rained out. More updates soon! He was better able to enjoy the good things in life. He made more progress on challenging projects. He lost patience for activities which were a waste of his time. He gained patience for worthwhile activities. He lost no productivity by eliminating multitasking. Reading it made me realize how much of the day I spend with random thoughts and distractions buzzing around in my head (again in addition to more obvious things like frequently checking email on my phone). There's a whole change of attitude possible here: take each moment and just do whatever you're doing in that moment. Today I stopped to listen to a thunderstorm, and was tempted to check mail while I was standing there, but I consciously resisted and kept with just one simple thing: listening. It may sound fruity, but it's a lot less stressful.